The Parthenon - Despite not being one of the Ancient Wonders, as is the Temple of Artemis and Statue of Zeus, the Parthenon is more famous than both. Much smaller than the Artemision, the Parthenon is not praised for its size so much as for its ideal proportions. Built after the other two temples, it is considered the culmination of Greek architecture, and is perhaps the most iconic image of Western civilization. Dedicated to Athena Parthenos, the patron deity of Athens, the Parthenon replaced the "Older Parthenon" (as it is now known) that was destroyed by the Persians during the invasion of 480 B.C.. That temple had not even been completed as it was being built in honor of the Athenians' victory at Marathon only ten years earlier. 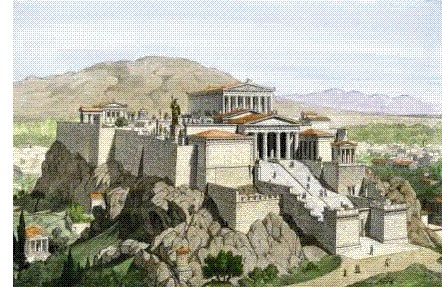 Construction of the second Parthenon was begun in 447 B.C. and was completed in 438; although decorations continued to be added until 432. The sculptor Phidias was appointed by Pericles to supervise the construction. He also built the statue of Athena that resided within the temple (see Phidias). Greek art focused on perfection (for example, most Greek statues reflected ideal human proportions) and the Athenians were determined to achieve "perfection" with the Parthenon. In Greek architecture, perfection was considered to be that which was most aesthetically pleasing to the eye, and it came to be known as the "golden ratio". It is represented by the letter phi (φ) and has a value of approximately 1.6 (there is a formula for determining that value with which I will not not bore you). Therefore, the dimensions of the Parthenon are based on this golden ratio (although some have disputed this). In addition, it contains an optical illusion meant to trick the human eye. The Greeks noticed that a straight line extended over a long distance appears to droop in the center; so they bowed the roof and the foundation of the Parthenon making all four sides higher in the center, and lower on the corners. This curvature counters the drooping appearance perceived by the human eye and the lines look straight, even though they are not. Unlike the temples of Zeus and Artemis which did not survive to see the Middle Ages, the Parthenon stood relatively intact until 1687, when it blew up from a Venetian bombardment while the Ottomans were using it as an ammo dump. It was severely damaged, although the outer facade still stands.